"Should not there be an opportunity for lawyers to join together and as a group seek enlightenment as to the law in other countries so that that knowledge could be carried home to improve what they have in their local statutes?" This query occurred to Judge Arthur K. Marshall, then Advisor to the California State Bar Committee on Probate and Trust Law. It was an idea whose time had come. 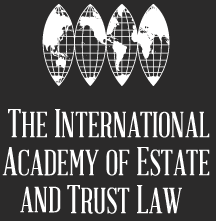 What followed was the formation of the International Academy of Estate and Trust Law in 1975. In the beginning, Academicians have primarily sought knowledge about the legal systems of the countries in which the Academy has met. It continues that quest, but as Academicians have become more familiar with the diverse legal systems of the home countries of its members, the focus of the Academy has shifted. Presently, Academicians concentrate on the analysis of the substantive requirements and the tax consequences of the transfer of wealth, be it during lifetime or at death. In that regard, the Academy now studies the entities through which wealth is transferred, including but not limited to corporations, partnerships, common law trusts, statutory trusts, foundations, and both common law and civil law bifurcated estates. Further, it delves into the use of such entities to preserve family businesses with multinational contacts. It studies the effect of marriage on property rights and the impact of divorce on property held by the spouses or either of them at the termination of the marriage. The Academy studies the effect of international conventions. Because many Academicians serve and have served as delegates from their countries to The Hague and as advisory members to their own state departments or comparable executive or legislative authorities in their countries, the Academy seeks to balance the possible detriments of the conventions to the body of local law with the benefits of attaining greater flexibility in the transfer of interests of property with multinational involvement. The Academy now has members who practice or have offices in twenty-six countries. Membership is highly selective. The Academy bylaws limit membership to one-fourth of one percent of the notaries, solicitors, lawyers, judges, and professors of any country. All Academicians must have practiced law in the Academy's areas of interest for at least ten years and must have distinguished themselves through lecturing, writing or participation in professional organizations. They must also have demonstrated a significant interest in the continuing development of the law of their own countries.